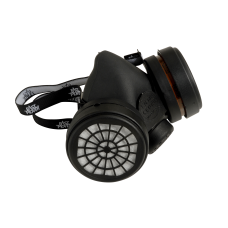 Twin half mask respirator with A1 P2 Dust filter cartridges suitable for automotive refinish workshops. This durable European made mask is manufactured from natural rubber and features fully adjustable straps ensuring a comfortable and efficient fit with maximum protection. The A1 P2 cartridges offer protection from organic vapours and gases and the replaceable cartridges can be used up until they expire or 28 days whichever occurs first. The cartridges are colour coded to European norms, EN14387:2004/A1:200843 and EN143:2000/A1:2006. Good price and it works, its not overly comfortable but what mask is. On me it was a little bulky to wear at the same time as goggles but not so much I didn't end up using it. I'll be looking for replacement filters so I can re use it.